The Parish of the Annunciation of the Lord is home to over 700 families. We are committed to helping individuals grow in familiarity with Christ through prayer, education and service. 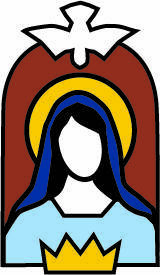 This logo shows the Holy Spirit descending upon the Blessed Virgin Mary, giving flesh to Jesus Christ our King. This reflects the history of the two parishes, Holy Spirit and Christ the King, that merged to form our new parish. We are excited about the new life we see around us and we pray that the intercession of Our Lady would inspire us as we move forward. We hope that this website is a useful resource for you in learning more about our parish and more about your faith.